Home » » 'Mockingjay - Part 1' May Not Get IMAX Release? 'Mockingjay - Part 1' May Not Get IMAX Release? One of the things that have been surprisingly absent from the promotional material released so far for Mockingjay - Part 1 was any mention of IMAX - and further evidence suggests that the film may not be getting released in IMAX theatres around the globe after all. So on your first question [...] about Mockingjay and Interstellar, as you know one of the things that’s been the key to IMAX in success has been our relationship with film makers and their willingness to do things like use IMAX cameras, promote the film, put IMAX DNA into the films, and some of the most successful films we have ever done have been with Chris Nolan and have surrounded his use of the cameras and infusing IMAX DNA. [...] I wish we could do everything all the time, but strategically it is much better for us to align ourselves with the preeminent filmmakers in the world and to get special treatment and special play gates and create a differentiated experience. 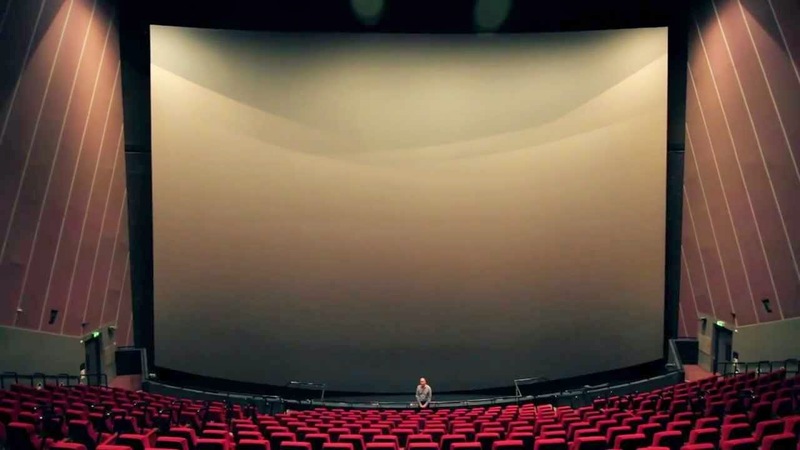 Also today, fellow fansite THGAustralia have received word from the IMAX theatres in Melbourne and Sydney that Mockingjay - Part 1 "was not made available to [them]" due to Interstellar, leaving hopes for an IMAX release unlikely. Lionsgate have partnered with IMAX most notably for Catching Fire, where the majority of arena sequences were shot with 15/70mm film IMAX MSM cameras - touted as the highest resolution moving image capture device in the industry. The entire 50-minute sequence in the film, including scenes outside the arena that were not filmed with IMAX cameras, was formatted for the 1.44:1 aspect ratio to be presented full-screen on the biggest IMAX screens in the world such as the BFI IMAX (top image) - unfortunately though just over 20 prints were made by Lionsgate (by comparison, The Dark Knight Rises played in 70mm in over 100 'real IMAXes', and Interstellar has been announced to play in the intended format in 50 IMAX theatres ) so only very few of these 'real IMAX' theatres got the show the film as intended. 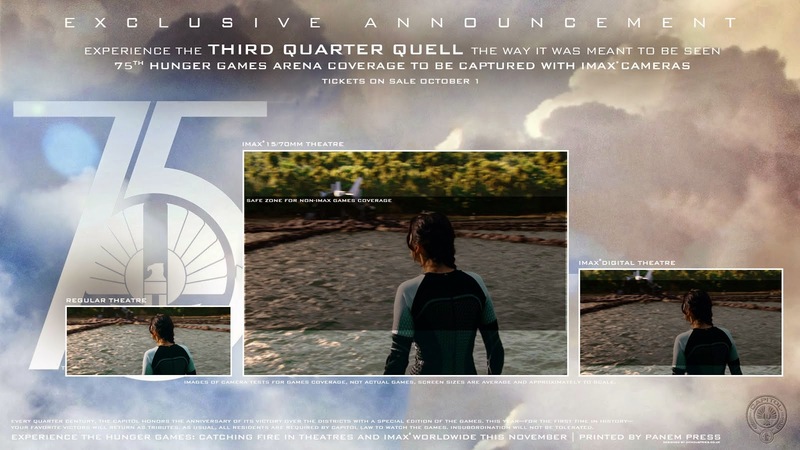 The expanded image formatting intended for IMAX theatres has been preserved on the majority of the Catching Fire Blu-ray releases. The Hunger Games had a limited two-week release in IMAX theatres, undergoing the upscaling process known as IMAX DMR to enhance the look of the film for the large screens - Mockingjay was expected to go through the similar process. Now, our hope lies in IMAX to release Part 2 next year in IMAX. It is very well possible due to Francis Lawrence having shot Mockingjay on digital cameras as opposed to films, IMAX will go one step further and make Part 2 a "formatted for IMAX" release similar to Skyfall and most recently Guardians of the Galaxy, whereby select scenes/the entire film is formatted for the 1.90:1 aspect ratio of the more common digital IMAX screens. We've reached out to IMAX for comment and hopefully we'll hear confirmation regarding Mockingjay's IMAX release soon. Stay tuned. UPDATE: IMAX have responded saying that "at this time, no announcement has been made regarding an IMAX release". So while they are still yet to officially state that the film won't be released in IMAX, it seems that a release is extremely unlikely given the circumstances.